One or more photo(s) has been virtually staged. Incredible price reduction for a limited time! 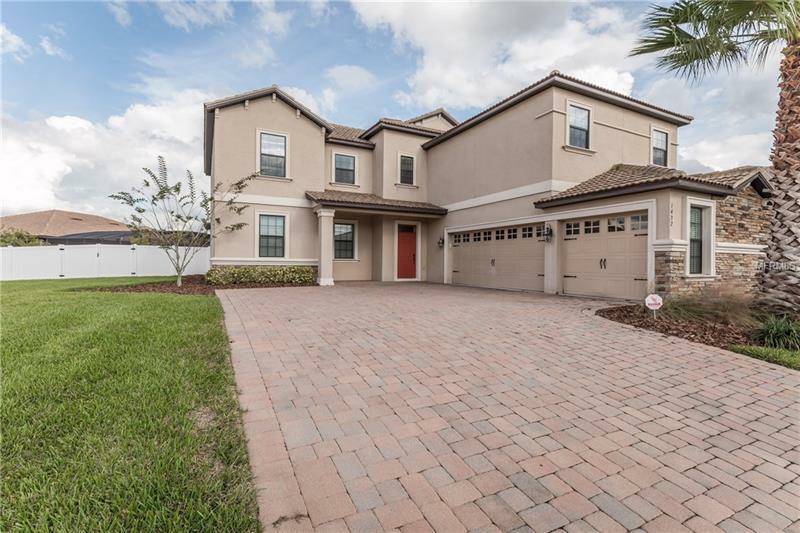 Estate home, in the peaceful 'Country Club’ section of the Champions Gate golf community, located just 11 miles from Disney! If you have a family look no further as this impeccable home will welcome you to a life style you can all enjoy. Its 5 bedrooms are all comfortably sized & there are 3 full bathrooms. One bedroom & bathroom is located downstairs for convenience. This home offers many upgrades which include high grade granite, & floor tile throughout the ground floor. The kitchen and living room are spacious & open plan, which is ideal for today's easy living. Both areas have windows and patio doors leading to the exceptionally large but privately fenced yard. The dining room is located off the kitchen for all the family to sit together, or there is granite breakfast bar & a dining area in the kitchen for easy dining overlooking the rear yard, & there's also the extra bonus side yard. There is a formal living area located at the front of the property providing ample areas for everyone to live comfortably. Upstairs has a HUGE game room which can also be a cinema/media room providing more fun areas. The 3 car garage has an internal door into the hall. Being in the residential side of this great community allows you access to the golf course, and the spectacular huge, communal pool with cabanas, and restaurant. Plus the kiddies fun splash area and lazy river. Come and start your new life style today & call me for a viewing. Amenities Additional Fees: Golf is included for owners. Pet Restrictions: verify pet restrictions with hoa. Copyright © 2019 Mid Florida MLS. All rights reserved. The data relating to real estate for sale on this web site comes in part from the Internet Data Exchange Program of Mid Florida MLS. Information provided is for consumer's personal, non-commercial use and may not be used for any purpose other than to identify prospective properties consumers may be interested in purchasing. TOP VILLAS REALTY participates in the MFRMLS Internet Data Exchange (IDX) program, allowing display of other MFRMLS broker's listings on this site. However may not include all listings currently available. Information is deemed reliable but not guaranteed. Information last updated at 2019-04-20 09:58:57.